Is Syria's Bashar Assad Getting The Upper Hand? : Parallels Since the Syrian uprising began, the opposition often seemed to have the momentum. But that dynamic seems to have changed recently. President Bashar Assad remains defiant and his army seems to be faring better, with help from Lebanon's Hezbollah militia. 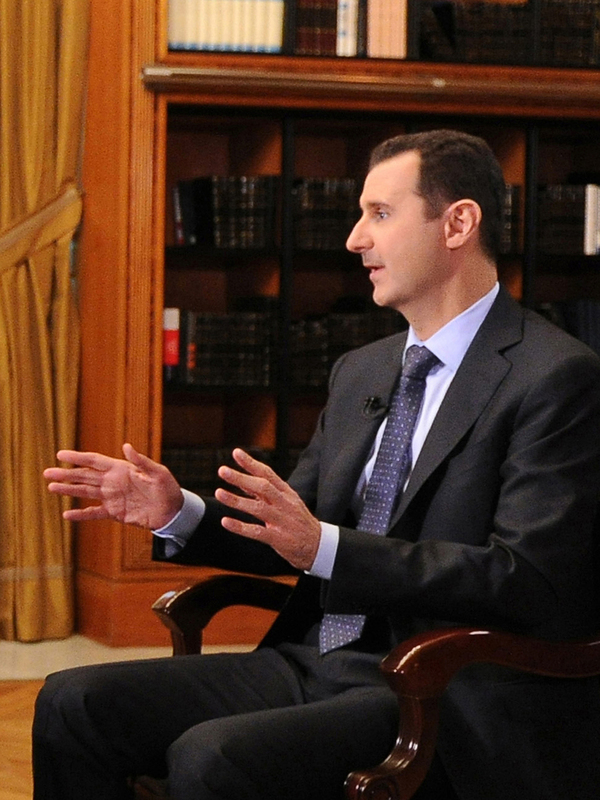 Is Syria's Bashar Assad Getting The Upper Hand? Syrian President Bashar Assad reiterated his intention to remain in his current position during a television interview last week. The Syrian president and his army have been looking stronger in recent weeks, many analysts say. After more than a year of military stalemate in Syria between the rebels and the government, President Bashar Assad appears to be making political and military gains and is not likely to be pushed aside anytime soon, according to many analysts. Assad reasserted his plans to stay in power during a recent interview on Al Manar TV, a channel owned by Hezbollah, the Lebanese Shiite militant group, which has openly joined the Syria war on Assad's side. The symbolism was clear. The Syrian president's pledge to retain his job was made as his army, backed by Hezbollah fighters, laid siege to the rebel-held town of Qusair, near the Lebanese border. Assad and his army often seemed to be on the defensive after the uprising began two years ago. But Hezbollah's help has restored Assad's offensive capabilities, argues Jeffrey White in a new policy paper for the Washington Institute. The town of Qusair may not be well-known to outsiders, but the town is strategically located on the Damascus-Homs highway, less than 15 miles from the Lebanese border. It's been a key supply route for the rebels. For the Syrian regime, Qusair lies along a corridor linking two of Assad's strongholds — the capital, Damascus, and the heartland of his minority Alawite sect, along the Mediterranean coast. The regime has been unable to dislodge the rebels for more than a year, but now the rebels appear likely to lose this town due to "Qusair Rules," says White. "The regime has found the war-winning formula," he says, combining Hezbollah fighters and irregular Syrian fighters backed by the army's armor and air power. The battle for Qusair has also highlighted Hezbollah's growing role in the Syria conflict. Reports over the past few days indicate that Hezbollah fighters have also massed in an around the northern city of Aleppo. For White, "Qusair Rules" mean the regime can count on manpower from Hezbollah and a steady resupply of weapons from Russia. A detailed list from a Syrian army general to a Russian arms supplier was translated and published online by Human Rights First. The list includes 20,000 Kalashnikov assault rifles and 20 million rounds of ammunition for the month of March alone. "We should focus on the ammunition and the tank tracks" coming from Russia, says White, rather than the potential delivery of the S-300 anti-aircraft missiles. The Israelis have threatened to destroy the Russian advanced air defense system as soon as it arrives. But the monthly shipment of more mundane armament is the critical supply needed to keep a conventional army on the move, says White. "The West is like Hamlet, constantly wringing their hands. The Russians are like Richard III; they know what they want to do — they want to win this thing," White adds. 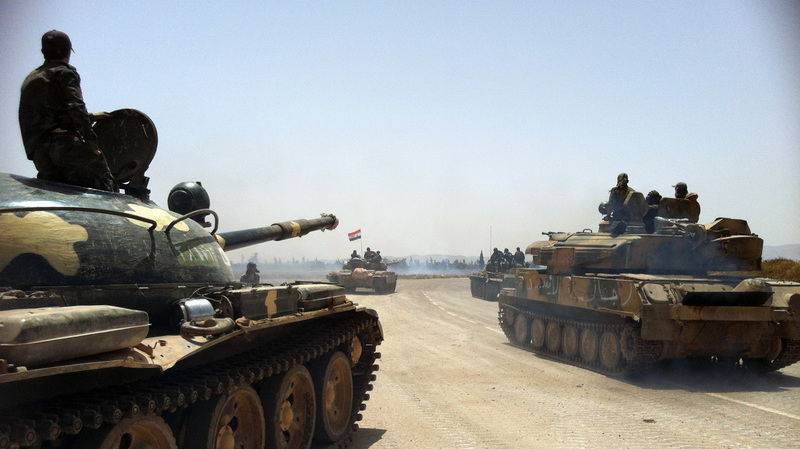 Syrian army tanks make their way toward a military airfield north of the city of Qusair on Sunday. Syrian forces have been battling opposition troops for control of the key city in recent weeks. The fight for Qusair has implications beyond the battlefield. In May, the Obama administration proposed a solution to the crisis by joining forces with Russia. U.S. Secretary of State John Kerry announced a conference tentatively scheduled for June in Geneva. While State Department officials continue to assert that Assad's "days are numbered," a regime win in Qusair bolsters Assad's position at the U.S.-Russia proposed negotiations, says Amr Azm, a Syrian-born history professor at Shawnee State University in Ohio. The Assad regime signaled acceptance of the Geneva negotiations during a surprise visit to Baghdad, a symbolic gesture by Syria's Foreign Minister Walid Moallem. He said his government will take part in a peace conference, stating it is "a good opportunity for a political solution." The announcement in the Iraqi capital was meant to send a message, says Azm. "When we go to Geneva, we are not alone," says Azm. The regime has backing from the Russians, the Iranians, Hezbollah and Iraq. "The U.S. wants the regime to go to Geneva as a chastised schoolboy, but the regime is showing, 'I am going as a sovereign state." Events over the past few weeks suggest that Assad is likely to survive for some time to come despite the regime's loss of internal legitimacy, growing isolation and a sinking economy, according to analysts. Michael Wahid Hanna, a Middle East specialist at the Century Foundation, says the contours have been clear for more than a year. He says Assad's longevity is due to a series of miscalculations and "wishful thinking masquerading as policy" on the part of the Obama administration and Western allies. While the White House and its supporters say the current approach is "cautious," some analysts charge that U.S. policy is out of touch with the realities on the ground. "Obama says Assad must go, and the Russians say he must stay. And they back it up. We don't," says Hanna. "There isn't going to be near-term region change." The surrounding states, meanwhile, are being dragged down by the Syrian quagmire. Lebanon, which was dominated by Syria for many years, remains closely linked to its neighbor. In addition to Hezbollah's role in the fighting, Lebanon continues to receive Syrian refugees. Jordan is floundering under the strain of a refugee population that threatens to destabilize the kingdom. Turkey, which has provided a haven for Syrian rebels and refugees, is reeling from a series of bombings in the southern city of Reyhanli. In Iraq, the Syrian war has helped reignite a sectarian conflict that never entirely ended. In a recent discussion at the U.S. Institute of Peace in Washington, numerous analysts expressed frustration with the limited role the U.S. has played in Syria. The participants focused on the daunting details of imposing a no-fly zone in Syria, but the talk soon turned to a critique of overall U.S. policy. "This is a war that Iran and Hezbollah have decided not to lose. We have not seen this level of resolve on the part of the administration," said Fred Hof, former top adviser on Syria at the State Department and now with the Atlantic Council. "There is a country destroyed by a family regime well-known for corruption and brutality, fully assisted by Iran and Hezbollah and enabled by Russia," said Hof. He argues that the "paralysis" in Washington comes from seeing Syria through the prism of Iraq and all that went wrong after Saddam Hussein was driven from power. The Obama administration continues to ask, " 'Gee, what will happen if the Syrian regime collapses?' " says Hof, adding, "Let's deal with what is staring us in the face."